Okay, here's another much-delayed "on the road" edition of Spoils. Please accept my apologies for these hotel room/lighting photos, but what's a writer to do when work has them many states away from the dumpy old desk of proper photography. Thought ol' Rustin could get this sucker writ on an aero plane but boy was Rustin so very wrong about that - so wrong it's kicked Rustin in to the third person. Or... Is Rustin actually three people. Poor, naive Reader. Rustin is not. But you've now you've been incepted with that concept can never again be sure. Welcome to Rustin's Week. Rustin will Spoil it for you. How wonderful is this figure!? TOO WONDERFUL!!! I'm pretty certain Reed gets a 100% all new sculpt here, and the body is fantastic (not even a pun!) - an average sized frame with a slightly-loose-fabric sense to the texturing. 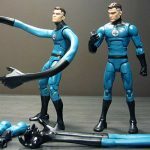 He comes with the Ultimate Nullifier and not one, but TWO alternate stretched-out bendy arms! He's so loaded he actually makes the previous Walgreens F4 figures feel a bit disappointing; and given his alternate limbs I'm ever more frustrated now that Sue didn't come with an alternate "solid" arm. 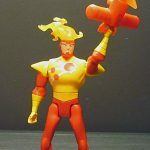 Likewise, I now really wish Johnny had come with an alternate "human" head, which could just be popped on to this body. 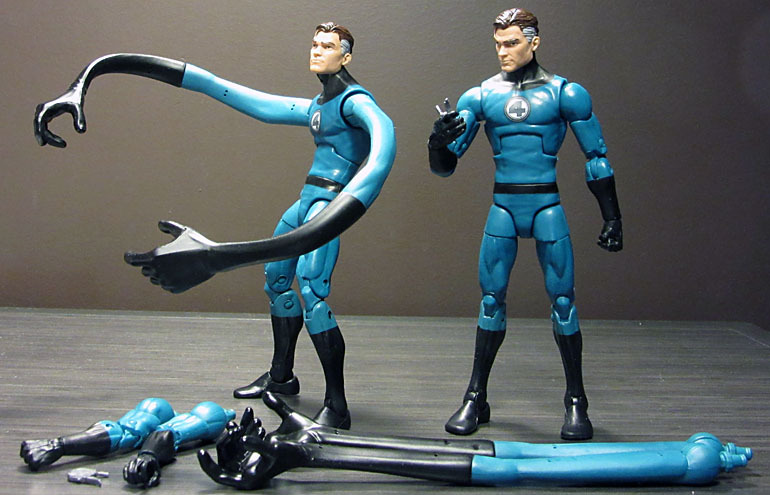 Given that Ben is coming with alternate heads and hands it would have been so nice to have been able to build up "Powers On" and "Powers Off" versions of the team. Oh well... regardless, this is THE BEST Mr. Fantastic figure ever released! Well this was unexpected and fun. I guess they're just trying to experiment with higher price points for Marvel Legends and this was a good place to start. 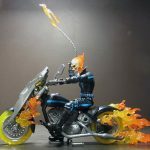 I've always vastly preferred Danny Ketch's outfit and bike to Johnny Blaze's, so I'm not too excited by this or the blue coloring of the outfit. But at least they did something a little different so that he wasn't an exact re-issue of the figure from the Rhino BAF series. One distinct improvement over that figure is this one's head and neck which are colored much more vibrantly and "realistically" than the bizarrely soft-rose hues of the previous release. The bike is neat but clearly designed for reuse. The skull faceplate clips on snuggly and gives it a nice visual style, though it's not an aesthetic immediately recognizable to me (and certainly seems like it should be more angled out, as on a chopper). The clip-on/plug-in flames fit on pretty well, though it is a bit of a struggle to keep them in place, and I really appreciate the intent of going translucent yellow on the tires, rather than black. I would have liked them a bit orange-r though, but still cooler than just plain black. When this was announced it got a big ol' eye roll from yours truly, but once I saw it in person... it had to be mine. 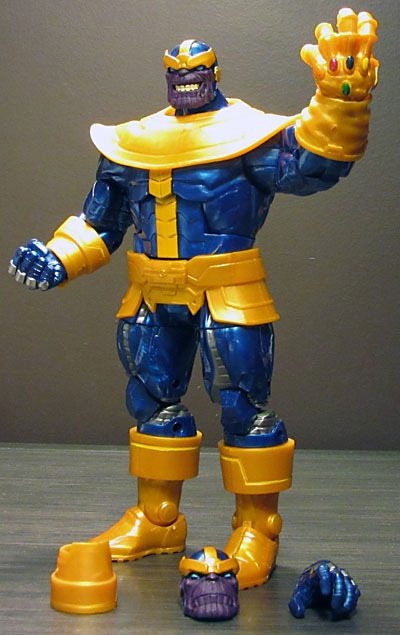 This is essentially just a repaint of the BAF Thanos but man is it an improvement. 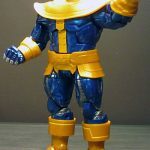 The gold bits are a bit brighter and shinier but it's the blue parts, now cast in a bright metallic blue plastic, that really make this sculpt sing and move it from a #NotMyThanos to a really neat take on the character and very welcome addition collection. 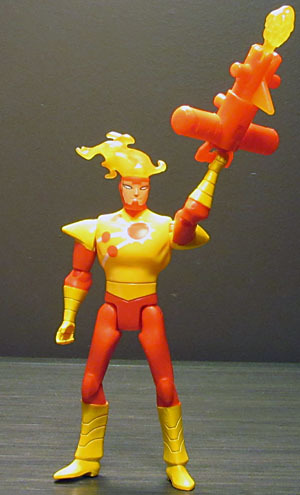 He also now comes with an alternate Infinity Gauntlet wielding left hand and alternate non-smiling head. The gauntlet is arguably the key selling point since the BAF lacked it, and I really appreciate that alternate head since it helps the two releases feel more unique, but I wish I could use it on the BAF since smiling Thanos makes more with WITH the gauntlet, but the coloring doesn't match. I suppose you could put the gauntlet on the BAF, but the metallic colors on this one help make him feel more "powered up." So... basically my point is that this is a really nice release and is successfully "different enough" to warrant hunting down despite having the original, though there are some nitpicks. 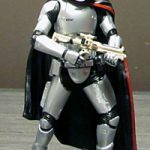 This is the Walmart exclusive "super articulated" 3 and 3/4" figure of ye olde Phasma. It is a more-or-less necessary addition since it/she can finally hold her gun with both hands, as is her on-screen default. 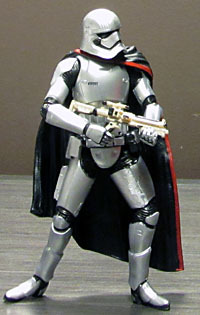 As a phan of the Phasma armor I'm quite happy to have this, and indeed think it's the second or third I've bought thanks to Walmart's various sales. One Walmart I checked out actually had this figure on pegs! AND on mark down! Some times the old brick'n'mortar hunt REALLY pays off! I got all three they had because (a) I'm greedy and (b) this is such a PERFECT armybuilder release! Essentially this is a Kir Kanos figure that comes with his training helmet, armored shoulder pads and signature double bladed staff, along with a little Scout Trooper pistol that fits in a holster on his belt. 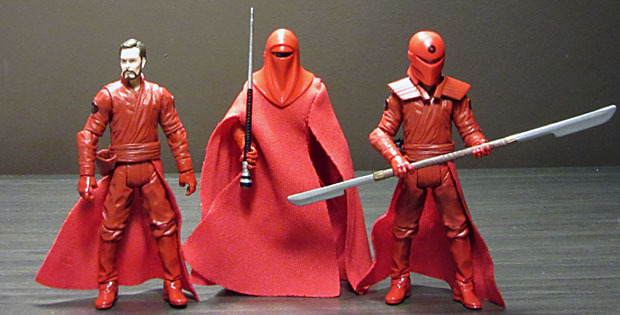 He ALSO comes with a cloth cloak, alternate Imperial Guard helmet and the Imperial Guard pike! So... I mean, come ON! Wish I could find and get a couple more! The sculpt is great and what paint there is is pretty good. I just wish he came with a right hand better equipped to hold the Imperial pike; otherwise, this is just a fantastic figure. This lil' buggar glows-in-the-dark! How could I not get him!? 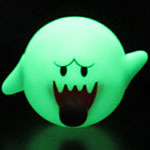 I'm not entirely clear on if this release is part of the regular line or if this glow version is exclusive to Walgreens, but that's where I got him, and I know I've seen a non-glow version before. His underside/belly is slightly flattened to help him not roll around, but he's still front heavy due to the sculpted facial details. His two little arms are actually on swiveling joints so despite being one of the small PVCs he's got articulation! The glow is good, too. Definitely a fun little addition to the Nintendo/Mario collection. I was happily going to sit this line out, but when I found they had a series with Firestorm, Swamp Thing and m'beloved Mr. Freeze I felt compelled to cherry-pick my way in. This is a pretty nice figure, with a solid consistent style to fit with the other toys in this aesthetic but without the bizarre proportions that make Superman, Wonder Woman and Batman too weird looking to own. Plus, this dude gets a surprising amount of unique tooling (given the "cheap" vibe of the line) - which is always a welcome touch! 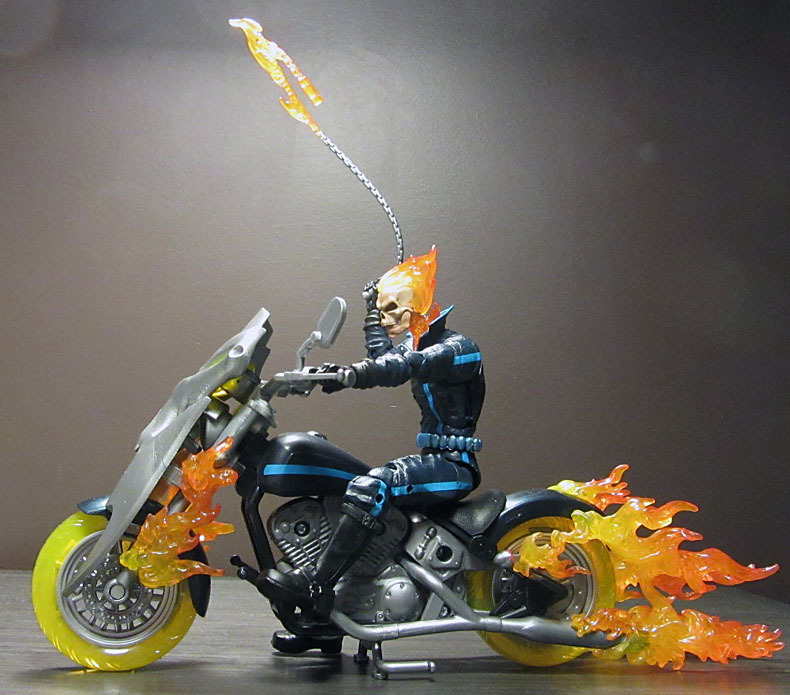 His translucent fire hair is particularly cool. He comes with a flick-fire missile launcher which is... whatever. 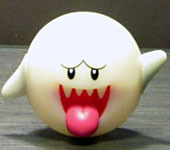 At least it can be held, like a weapon, or plug in to his back, like a rocket pack, so there is some flexibility to it. All in all, a nice and fun little $10 toy. MY MAN! I really like the sleek aesthetic of this design, harkening a bit back to the BTAS design. He's cast in a pearlescent dull blue and has paint navy blue pieces but the shades are a bit too similar to really look all that good. Weirdly, the red dot on his chest is just painted on, there's nothing for it in the sculpt, so it just looks cheap. His bell-jar helmet can pop on and off easily which is a great and welcome touch; and means we can easily pose his head as desired! 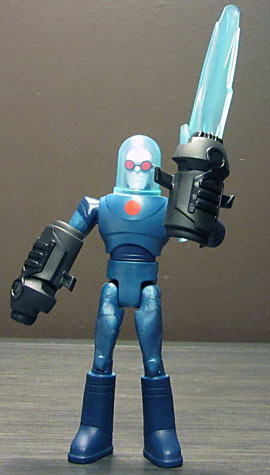 He comes with a translucent blue ice sword and two metallic gray glove-like things. 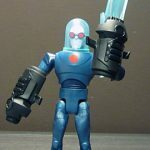 The ice sword can plug on to the inside of the gloves and the two gloves can plug together... and while they all look neat there's not clear logic to any of them, so... cool? Still though, this design and sculpt are really nice and I'm kind of tempted to get a second to repaint! Whoa! I remember seeing this guy at SDCC but never heard another peep about him so it was a really cool surprised to stumble upon him on shelf! He's part of the mainstream (read: kid targeted) 6" Justice League line and is about what you'd expect from it. Solid sculpt, balljoints at the shoulders, elbows and head, then hinges at the hips and knees, with a swivel cut at the waist. 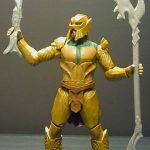 Paint is minimal, but fine enough, and as a cool touch his rubber-cast "loin cloth" is cast in a bronze color offering a nice counterpoint to the gold armor. His helmet is also cast as a separate piece and glued on giving him a more dynamic look. He comes with a giant can opener and a generic looking bio/sci-fi rifle (which he can't hold in any convincing fashion). Especially at $10 it's a cool figure and I'm tempted to battle build him up! ...But then I remember these guys barely appear in a movie I didn't care for so... NO, Rustin. Save that cash. YES!!! I've been dying for this and never saw it at TRU so I was quite thrilled to finally spot it at some random comic shop! 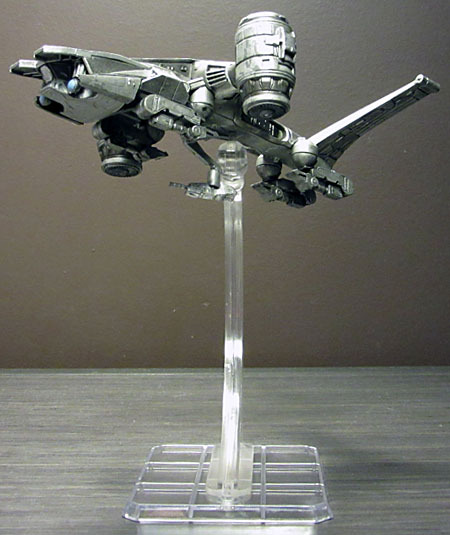 The Hunter-Killer is such a cool and iconic design, it's such a classic! Just like Cameron's dropship from Aliens which is also a highli- ...wait... the Hunter-Killer is basically he same design as the Dropship...! Well that's a bummer... but I guess it explains why I dig it so much. Aaaaanyway, it's a fantastic sculpt with simple but effective paint. 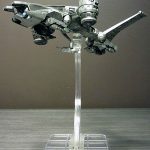 Surprisingly the only articulation on it is the gun underneath it, which is on a ball-in-socket joint which is connected to an arm on a hinge joint. It's a nice feature but it's kind of a bummer that the landing gear don't work, or that the "eyes" don't swivel, or that the jets don't rotate. We don't really see that happen in the movie but since they're present it'd be nice, especially the "legs" which are so well sculpted that they LOOK like they're articulated (I almost broke one before I realized it was sculpted closed, not stuck), Also, in retrospect I think I'm just setting expectations for this on the Playmates Salvation version. At any rate it is a great sculpt and is partially diecast so it has some nice heft to it. It comes with the standard Cinemachines flight stand, which offers a ratcheted balljoint allowing some options for display, which is nice (even if its peg is a super, tight/touch fit in the ship's peghole). Money was tight in the fall so I passed these up, but now with the show cancelled the line is getting dumped and there won't be any restocking so I'm thankful I was able to at least find a couple. 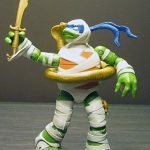 Leo is my BAE (god I hate that I just used that term) and I love mummies so this figure is my hella jam, other-juvenile-slang-I'm-not-cool-enough-to-know. He's got a fantastic sculpt, considering the line, complete with texturing on the bandages AND skin! He's got corpse-y finger and toenails, which honestly looks kind of too weird to me. Most impressively, though, is an extra point of articulation! 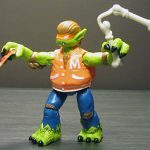 There's a hinge joint mid-foot on his right stomper that isn't necessary but does allow for more dynamic, mid-step posing and instantly I wish all the TMNT figures had this! 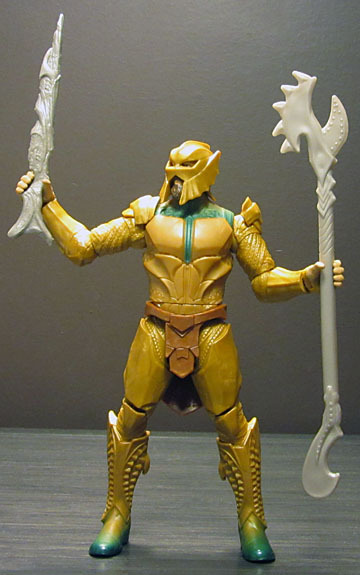 Leo comes with a gold dagger, a gold Scarab beetle glued to his left thigh and a gold cobra wrapped his torso. The cobra is removable and sits well on its own. The gold is neat and helps sell the Ancient Egypt motif, but it's not clear if that's meant to be jewelry or a real snake. All in all, I adore this figure and wish I'd gotten him sooner (and snagged a second to repaint to really bring out all the detail in the sculpt)! It's a bummer that retro, ironic "love" of Teen Wolf resurrected the premise and made that the go-to reference for this generation, but what're ya gonna do. I'm, clearly, not that crazy about the letterman jacket here but at least it does make him stand out a bit more (while also, combined with the slicked back Greaser hair, making him seem anachronistic to the other figures in this series). He's sculpted covered in hair, other than his face, which is weird, especially since only some of it is painted brown. Like Leo he too has a nice mid-foot hinge joint, this time on the left foot. 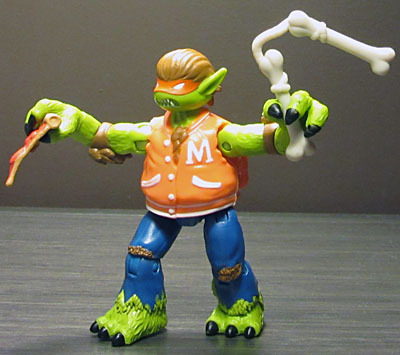 Mikey gets a fun set of bone nunchuks and A SLICE OF PIZZA! That in-style slice of pizza is almost worth the price of the figure alone, and will definitely get donated to another Mikey figure! I never found "regular" Usagi in the normal line, so since the line is dead I accepted I never will and got this big twelve-inch version. This sculpt is pretty solid, given what the line is, and the paint is pretty tight'n'clean. He's got hinged hips and shoulders, despite them REALLY looking like they're balljointed. 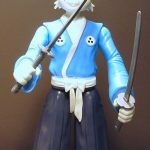 His wrists have swivel cuts, so at least there's that, and his head is on a ball-in-socket joint, though it's got limited motion. 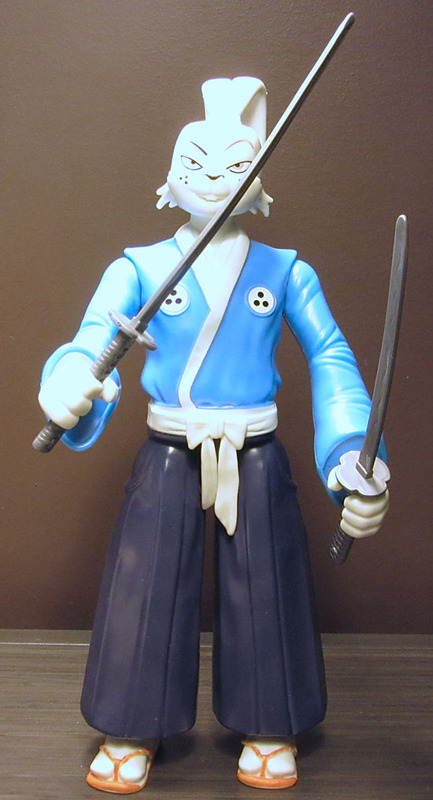 And, of course, he's armed to the teeth with his two katana. It's a nice figure, but nothing all that special. It's just nice to have the character around in toy form once again. 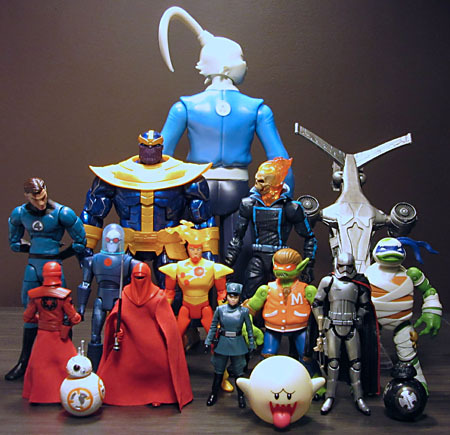 This entry was posted in Rustin's Spoils of the Week and tagged Batman, Fantastic Four, Ghost Rider, Justice League, Nintendo, Star Wars, Terminator, TMNT, Universal Monsters. Bookmark the permalink. 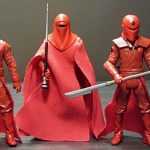 I'm so confused about that royal guard figure. Never heard of it. Never seen it here, and I can barely find any info on it online. He's from that last wave of Vintage Collection figures. Hasbro repacked him, Ahsoka, General Lando, and Ackbar for a wave of Walmart's exclusive Black Series. Did you forget to mention the Imperial disguise Rose, BB8, & BBH8 pictured? If you don't like their original paint jobs, just repaint the ones you've already opened instead of buying duplicates.